Features a locking hinged door with a shatter resistant panel. All aluminum frame with a natural colored vinyl thumbtack board and option for a letterboard insert. 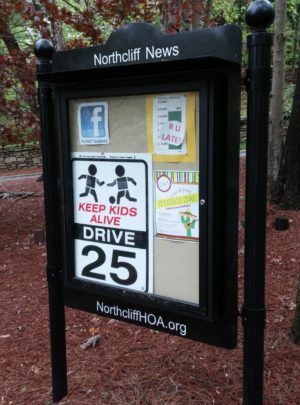 Whether you are a Homeowner Association (HOA), Property Manager, Church, Cemetery, Park, or Municipality, our high-quality Outdoor Message Center (Message – Bulletin Boards) can display messages in a classy way while withstanding the elements. Most of our customers want a professional upscale look that matches the look of their existing posts, signs, mailboxes, or community buildings. We call it an “Outdoor Message Center” because it is free-standing with posts, cross arms, and a flanged protective overhang. It is an ALL ALUMINUM structure with stainless steel hardware – there is no need for painting or dealing with deteriorating wood or vinyl. These units are hassle-free and last for many years. We have shipped hundreds of units from Alaska to the Florida Keys. Be sure to familiarize yourself with the numerous options! Magnetic board insert with 2” magnetic letters (white on black, or black on white) also works with Dry Erase Markers. Order Your Outdoor Message Center! Order online or call 404-419-6236 to order or get a free Outdoor Message Board estimate. Our Outdoor Bulletin Boards are available for shipment nationwide.